Rental can be an affordable alternative for those needing shorter-term solutions such as accommodating an aging or disabled relative over the holidays or recovering from a surgery. Rental often meets the immediate need without long-term commitments or expenses. As a general rule, if you’ll need a mobility solution for less than a few months, rental may be the answer. When you have such a temporary need, let us help. We can quickly install a lift to suit your needs. For a little extra we offer accessories including a folding rail which eliminates tripping hazards and blocked doorways. Add adjustable brackets for irregular stair treads (extra). Mobility at Home also offers Rentals with Purchase options on some items. Call us to set up an appointment to learn more about these exciting programs! 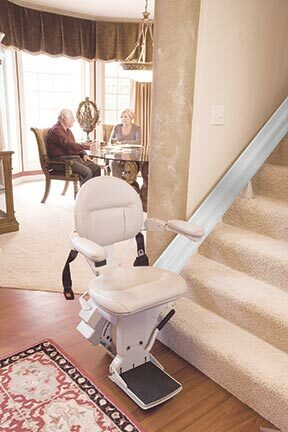 Stair lifts rental is $200 per month with a 3 month minimum. *Set up and removal fee of $600. Auto lifts have to be installed at showroom so no delivery fee. *$40 delivery fee for manual or heavy duty. Pricing is dependent on the number of feet of ramp needed. Please contact us for pricing.